Ship your overseas shopping with vPost! Ships from U.S, Europe, Japan, China. Refer to VPost website for more details. Enjoy Cashback when you ship with vPOst! Also find the latest promo code at ShopBack to save more! Don't forget to clickthrough ShopBack! 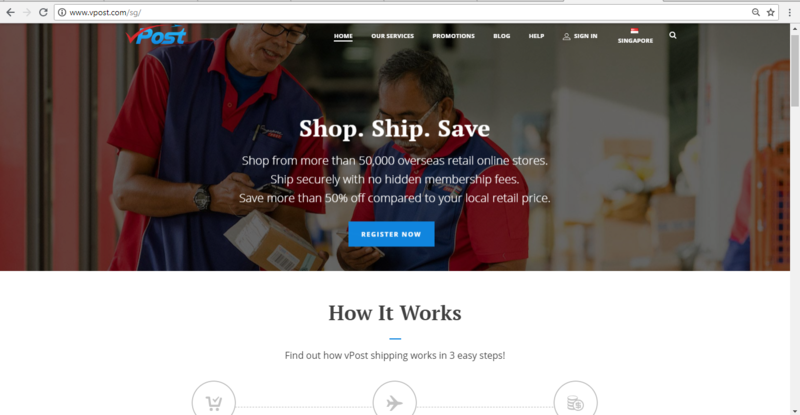 vPost: Shop from USA merchants and get it delivered to you plus Cashback! To save more, visit ShopBack and find the latest discount code! Now there's more options for you to shop at with vPOst! Enjoy shipping from fashion merchants around the world! Find the latest vPost code at ShopBack now! Enjoy the bounties the world has to offer! Ship with vPOst from over 50,000 merchants! Plus with ShopBack you get to enjoy Cashback and info on the latest vPost promotions! Lots of places for you to save on with vPOst and ShopBack! Get Cashback by shipping with vPost on your orders off merchants in Japan. Also the best info on a vPost promo code at ShopBack! Ship from China with vPost and earn Cashback! Also, for more savings, the latest vPost discount code can be found at ShopBack! Ship from Lifestyle stores from all over the world! Look for a valid vPost discount code at at ShopBack now! All of the world's lifestyle brands await you! Shop from merchants in Europe and let vPost help you with shipping! Earn Cashback and find the latest promo code with ShopBack! Sports product - get it shipped from around the world! Look for a vPost promo code at ShopBack to save more! Use ShopBack for additional Cashback savings! vPost is one of the largest online shopping and shipping merchant in Southeast Asia. vPost or Virtual Post is a subsidiary of Singapore Post Limited (SingPost), a trusted household name in Singapore providing services like mail, ecommerce, retail and logistics. Ever since its introduction in 1999, vPost has gained massive popularity in Singapore due to its efficient and unique service which is easy to use for all the consumers. What makes vPost unique is the fact that it provides amazing opportunity to its customers in Singapore to shop from global brands and merchants without having to travel overseas. There are several merchants in USA, Europe, Japan and China that do not accept international orders or impose high tax rates on their products for shipping internationally. vPost solves this problem and allows its customers to shop from these merchants at affordable prices, without any hassle. All you have to do is to log on to the vPost website or download the vPost app on your mobile phones to start shopping. vPost or Virtual Post was launched in 1999 by SingPost (Singapore Post Limited) to offer an online channel for performing postal-related transactions, bill payments and online shopping. SingPost, an established postal service provider of Singapore, already had a network of post offices and Self-serviced Automated Machines (SAMs), and vPost was launched with the vision of complementing the existent services of SingPost. The vPost website was initially introduced as an online channel for bill presenting and payment services. However, over the years, vPost has widened its domain of online services by foraying into online shopping and shipping services. The online channel allows its members to shop at multiple merchant websites in US, Europe, China and Japan by providing the vPost members with free personalised addresses in these countries. This opens a gateway for the customers to purchase directly from the overseas websites, even from those that do not accept international orders. vPost has gradually emerged as one of the largest online shopping and shipping service providers in the Southeast Asia with its massive customer base. vPost offers a great range of products from many online merchants. The website acts as an intermediary between global brands and the customers. The services offered by the online platform include shipping from USA, Europe, Japan and China. Here is a short preview of the services available on the vPost website. Shipping from USA – vPost allows the Singapore consumers to shop from the best of USA merchants and brands. These orders are then shipped at the customer’s doorsteps. 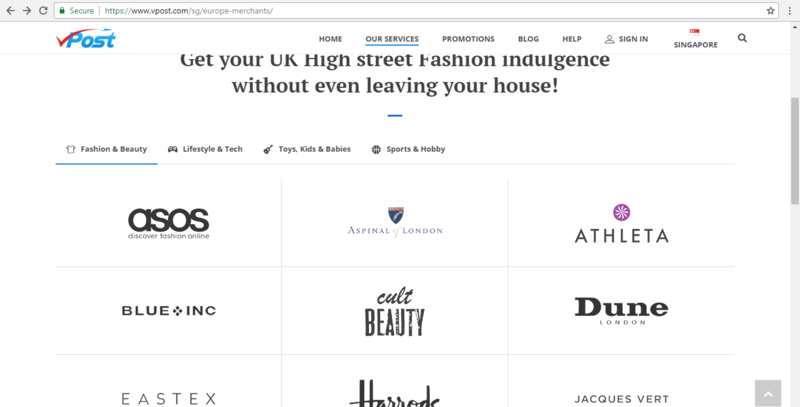 The merchants on the website are divided into four categories i.e. Fashion and Beauty; Lifestyle and Tech; Toys, Kids and Babies and Sports, Hobby and Health. Shop to your heart’s content from the top brands of USA while sitting within the comfort of your Singapore home. Shipping from Europe – For customers who love European brands and shopping merchants, vPost offers a golden opportunity to purchase their favourite products without having to travel to Europe. From high street fashion merchants like Harrods, Cult Beauty, ASOS and Jacques Vert to sports brand like Speedo, vPost promises to ship the products from Europe and deliver at your Singapore address at affordable prices. Shipping from Japan – If you love products from Japan and are unsure where to look for the Japanese items online, then vPost is your place to be. 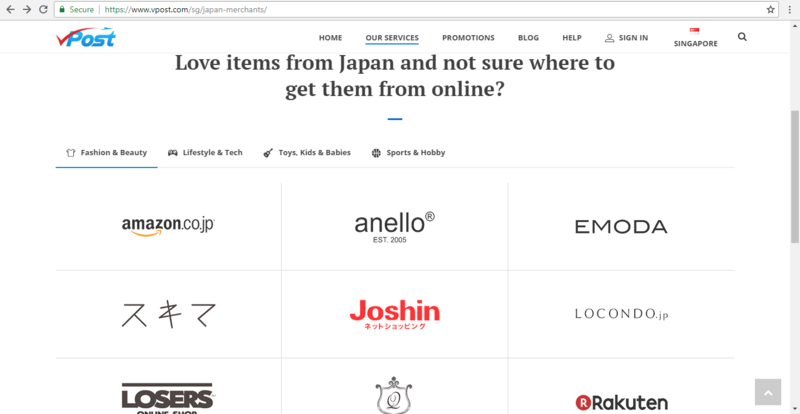 vPost ships authentic Japanese products sold by popular online merchants such as Amazon Japan, Rakuten, Joshin, Usagi Online, Akazuki, Japanet and the like. 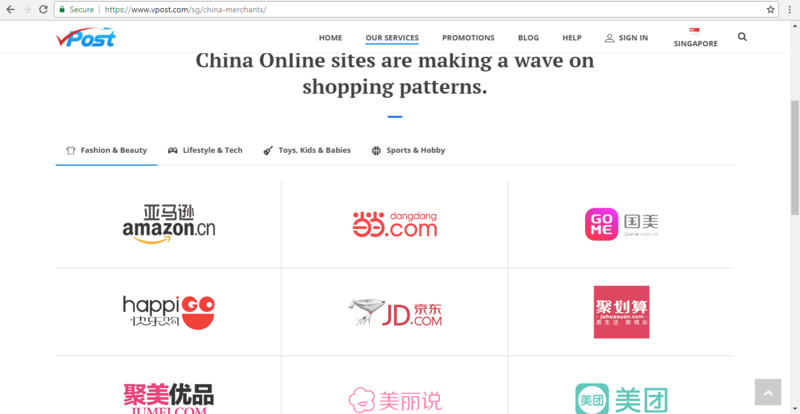 Shipping from China – Under this category of services, the vPost website offers shipping of a wide range of products sold by various popular Chinese merchants such as Amazon China, Taobao, Tmall, Superdry, Dangdang, Jumei, Juhuansuan, and the like. How to Shop at vPost? The vPost website has a user-friendly interface that offers a seamless and intuitive shopping experience for all the customers. 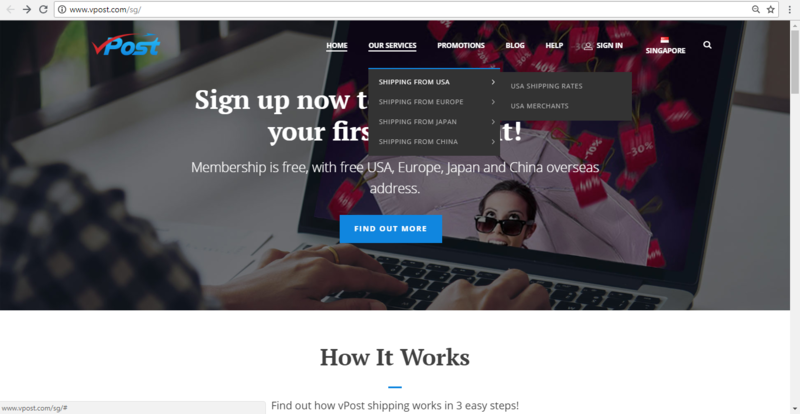 The top bar of the homepage features categories like “Our Services”, “Promotions” and “Blogs” where consumers can find all the important information regarding shopping and shipping at vPost. Step 1: For purchasing products from vPost, select the country/region from where you want to shop and click on the merchants option. 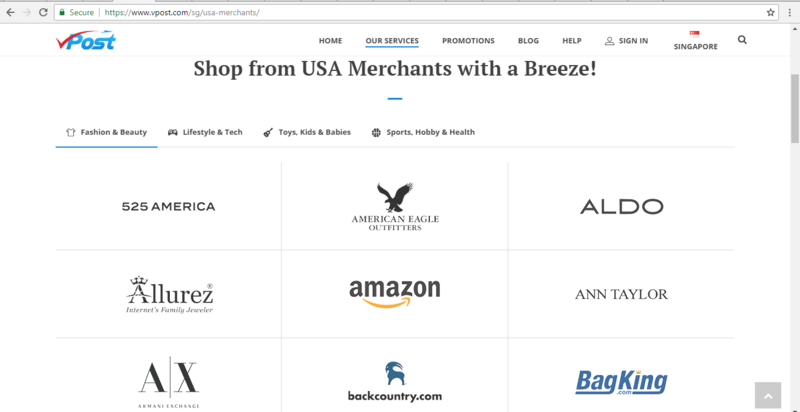 Step 2: You will be directed to the page where all the merchants available in that region are listed. Select the merchant you want to shop with. Step 3: You will land on the page displaying all the product subcategories sold by the merchant you have selected. Choose a subcategory of products. You will be directed to the product listing page from where you can select the product you wish to purchase. Step 4: You will be taken to the page displaying all the details of the product you have selected. Once you are satisfied with your choice, click on ‘Add to bag’ button on the right pane of the page. Check your bag by clicking on the bag icon on the right corner of the page. Step 5: If you want to purchase more items then you can continue shopping, if not, then click on the ‘secure checkout now’ button at the bottom of the page. Step 6: On the checkout screen, enter your name and other details such as contact number and email address and click on ‘continue to delivery’. Step 7: On the next page, enter your shipping details and click on ‘continue to payment’. On the next page, fill in your payment details and complete the transaction. You will soon receive your order confirmation via email and a message on your contact number. Step 8: There is an alternative way to shop via vPost which could help you save a lot of money. The registered members of vPost can go to the merchants' page they wish to shop at and complete the usual shopping process. While entering the address, key in the vPost address and number. This way, the package would be sent to the local vPost warehouse instead of direct shipping, avoiding extra sales tax imposed by the seller since the delivery will be local now. Likewise, this method can be effectively utilised to acquire the goods from sellers that do not sell overseas. After this, the customer shall keep a track of his/her order through vPost tracking on the account. Once the item has arrived, the customer will get a notification from vPost. All they have to do is to log into his/her vPost account and choose from standard vPost shipping, economy or sea shipping, then check out and pay for the shipment. Credit/ Debit Cards: The customers at vPost can make payments for their orders through their credit or debit cards verified by VISA or MasterCard. This payment option is a safe and secure way to transfer money online. American Express: vPost also accepts payment made through American Express (AMEX) cards. These cards can be used for transactions anywhere in the world. vPost offers many discounts and deals to its customers from time to time. Some vPost discounts are offered for a long time while some vPost discount coupons are available for a limited period only. The consumers can save a lot of money on the products available on the website by applying the vPost coupon codes or vPost voucher codes that the online platform offers during sale period. At present, the customers can earn up to 2% cashback on vPost products if they shop with the merchant via a registered account at Shopback. There are some other vPost deals that can be availed via ShopBack such as vPost promo codes, vPost coupons and vPost vouchers for heavy discounts during vPost promotions. How to Redeem Coupons and Vouchers at vPost? Online shopping can be a very rewarding experience where customers get plenty of opportunities to save money on their purchase. Several websites offer codes and vouchers that can be redeemed to earn cashbacks and discounts on products. Step 1: Select the item that you wish to buy and click on 'Add to Cart'. Step 2: Once you have selected all the packages that you would like to purchase as well as your preferred shipping mode, click on ‘Next’. Step 3: On the order summary page, you will find a box under the order summary section where you can enter your vPost discount code or any other applicable vPost code for availing discounts. Click on ‘continue’ to go to the payment screen. Step 4: Select the payment method as per your convenience and enter the payment details to complete the transaction. Step 1: Visit the ShopBack website and select vPost store from the list of merchants and brands on the homepage. You can also use the search box to find the link to vPost store. Step 4: If you are willing to find more attractive deals and coupons, check out the 'vPost Discount Codes, Promo Codes & Coupons' section. Step 5: You will be directed to the vPost website to browse and select the products you intend to buy. The cashback offer is not applicable on purchases made on vPost app. Before the item is delivered to the local mailing/delivery address or made available for self-collection at any self-collection point, the customers shall promptly pay all duties and taxes, any additional charges for customs clearance and any other applicable charges imposed by any local or government authority of the destination country. The vPost shipping charges cover handling charges, overseas shipping and local delivery charges from the vPost address to your local mailing/delivery address or the self-collection point (POPStations). You can find out the vPost shipping rates for different destinations on vPost's website. Customers shall ensure that items purchased from merchant’s website are not included in the articles prohibited by the country of origin and/or the country of destination. As vPost only provides for the customer’s item to be shipped from the vPost address to the delivery address, the self-collection point (as the case may be), vPost shall not in any way be involved or concerned with any claim for refund, return, rebate or exchange of any item in the shipment. For all such items, the customer will need to liaise and deal directly with the merchant for of any refund, return, exchange, rebate, and money-back guarantee policy and/or procedure. All returns, exchanges, refunds, rebates, money-back guarantee policies and/or procedures will be in accordance with the merchant’s policies and procedures. For the return of items, the customer will need to make its own arrangements to send the item back to the merchant, for return or exchange, at their own cost. There is a comprehensive list of terms and conditions on the vPost website that you must go through before making your purchase. For any enquiry or assistance, customers can contact the vPost customer service on their online chat window available from 08.00 AM to 08.00 PM every day, or by calling on their hotline number 1605 (Press #4 for ‘vPost’) or +6568412000 (outside Singapore).